The 6F5P Triode-Pentode is designed for operation in Vertical Sweep Units of Widely Used Television Receivers. 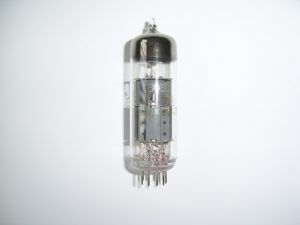 The 6F5P Triode-Pentodes are Miniature Devices enclosed in Glass Bulb and provided with a Nine-Pin Base and an Indirectly Heated Oxide-Coated Catode. The 6F5P Triode-Pentode is a very best for Audio Applications!